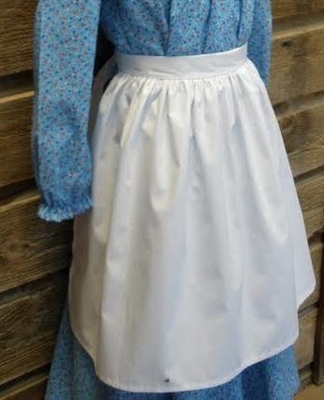 Lovely Prairie Waist Aprons, ties in the back. In stock in white or cream cotton muslin. If you are interested in a different color, please email us. Ladies is 30 in. long and recommended for sizes M-XL. If you need plus size, email us if you can't find them on our site. In stock and ready to ship. If you need more than are in stock, please let us know and we will restock as soon as possible.